Combined with the recent sentencing of Aurora shooter James Holmes, as well as another recent incident where a man attacked theatergoers with pepper spray, a hatchet, and a pellet gun in Tennessee, it’s enough to make the simple act of going to the movies scarier than your average late-summer horror flick. There are bigger factors at work here, of course, but movie-theater chain Regal Cinemas is attempting to address the problem on a practical level with a new bag check policy for all of its theaters. Security issues have become a daily part of our lives in America. 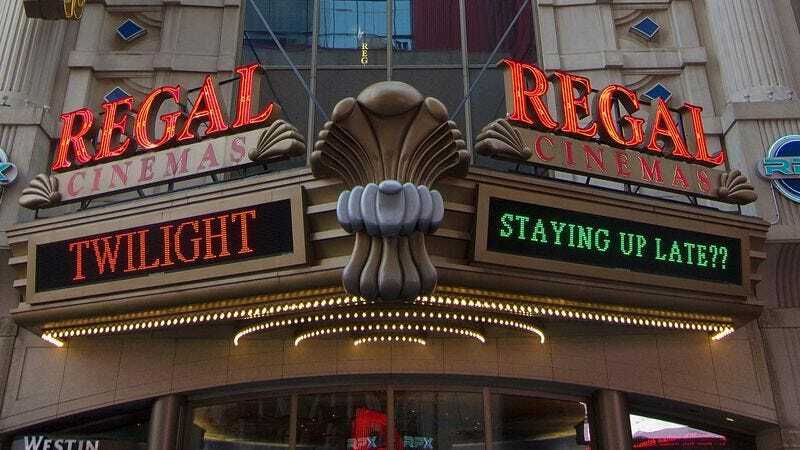 Regal Entertainment Group wants our customers and staff to feel comfortable and safe when visiting or working in our theaters … We acknowledge that this procedure can cause some inconvenience and that it is not without flaws, but hope these are minor in comparison to increased safety. On a lighter note, thrifty moms everywhere are now going to have to develop James Bond-level concealment skills in order to sneak homemade snacks into Saturday afternoon matinees.